*Perinatal death is the death of a child under one week of age (0 to 6 days) or a stillbirth of 28 or more weeks of gestation. Source: CICH graphic created using data adapted from Statistics Canada. 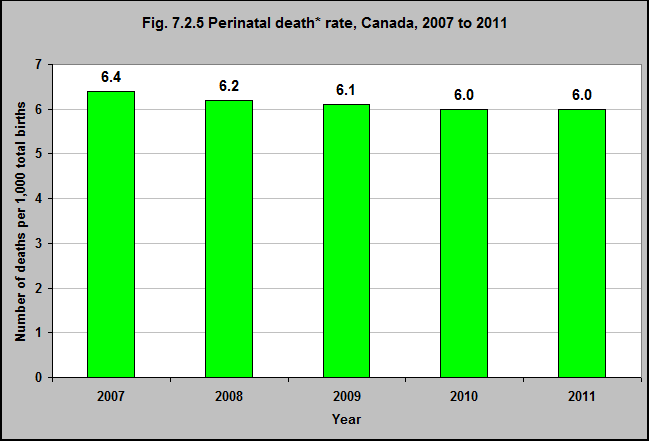 Table 102-0508 – Perinatal mortality (number and rates) and components, Canada, provinces and territories, annual. http://www5.statcan.gc.ca/cansim/a26?lang=eng&retrLang=eng&id=1020508&&pattern=&stByVal=1&p1=1&p2=-1&tabMode=dataTable&csid= -accessed June 21, 2017. The perinatal death rate was 6 per 1,000 total births in 2011. The rate was stable between 2007 and 2011. 1Statistics Canada. Table 102-0508 – Perinatal mortality (number and rates) and components, Canada, provinces and territories, annual. http://www5.statcan.gc.ca/cansim/a26?lang=eng&retrLang=eng&id=1020508&&pattern=&stByVal=1&p1=1&p2=-1&tabMode=dataTable&csid=-accessed June 21, 2017.